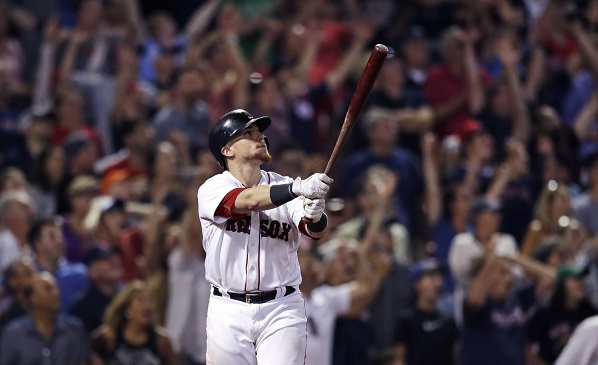 Christian Vazquez’s first home run of the season was a big one, a three-run walk-off to give his Boston Red Sox a 12-10 victory over the visiting Cleveland Indians on Tuesday night. In a way it seemed fitting that the light-hitting Vazquez, who is slugging a paltry .365, hit the game-winning home run off Cleveland closer Cody Allen, who is generally lights-out. The game had already been one of unexpected turns and subverted expectations, and Vazquez’s home run was the perfect nightcap. The game, which featured six home runs and 22 runs scored, was not supposed to be a slugfest. With Chris Sale and Carlos Carrasco, two of the American League’s top pitchers, as the game’s opposing starters, and the middling offenses of the two teams, the game had all the looks of a pitchers’ duel. But Cleveland hit three straight singles off Sale in the top of the first, and the offensive barrage began. Carrasco made it through just 1 2/3 innings, conceding five runs. Sale made it through five innings, but allowed seven runs of his own. Just as inexplicably as the early offensive explosions against the starting pitchers, both teams’ relievers, some of the best in the game, suddenly could not get the job done. The Indians’ situation seemed strong. After Carrasco’s early implosion, relievers Tyler Olson and Dan Otero had pitched 3 1/3 scoreless innings. 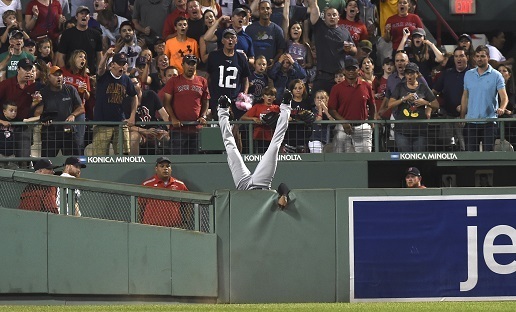 The defense had also been coming through, as center fielder Austin Jackson made an incredible catch leaping over the outfield wall to take a home run away from Boston’s Hanley Ramirez. But then in the sixth inning, Bryan Shaw and Andrew Miller, two of the game’s premier relievers, squandered the Indians’ early 7-5 lead. Using four hits and a hit-by-pitch, and taking advantage of a throwing error by Jose Ramirez, the Red Sox scored four runs in the sixth to take a 9-7 lead. This lead too, seemed secure. Blaine Boyer and Matt Barnes each threw a scoreless inning of relief. Even after Addison Reed surrendered a home run to Carlos Santana, cutting the lead to 9-8, the lead seemed safe. Boston closer, Craig Kimbrel, took the mound in the top of the ninth and got two quick strikes on Cleveland’s Francisco Lindor. Kimbrel, who is striking out batters at a rate of over 16 per nine innings pitched, was right where he wanted to be. So naturally, Lindor hit Kimbrel’s 0-2 fastball over the Green Monster in left field for a game-tying home run. Kimbrel settled down to strike out pinch-hitter Bradley Zimmer and get Michael Brantley to ground out, but then two singles and a walk loaded the bases, and Kimbrel threw a wild pitch to bring home the go-ahead run. In the bottom of the ninth, the game took its final turn. Despite allowing a single to Rafael Devers, Cleveland closer Cody Allen appeared to be in control. He struck out Jackie Bradley Jr. He got Xander Bogaerts to fly out. And then with two outs, Red Sox first baseman Mitch Moreland swung and missed at Allen’s 2-2 pitch, striking out. But the game refused to end quietly. Allen's pitch went wild, eluding catcher Yan Gomes and allowing Moreland to reach first. That brought up Vazquez, who worked Allen to three balls and strike, then sent his next pitch deep into the Boston night, bringing an end to a 3 1/2-hour game where nothing could be expected.